Any info on the 61st (Caernarfon & Denbigh) Medium Regiment RA? Discussion in 'Searching for Someone & Military Genealogy' started by Singvogel, Feb 15, 2015. Hi, 11425128 Gunner Milne - 61st Med Reg Royal Artillery, here. I'm trying to piece together details of my movements in NW Europe in 1944 & 45 especially in the Netherlands, as I have somehow muddled the exact order of the cities we were in such as Arnhem, Nijmegen and then across the border to Bochum in Germany. My memory is not what it was, and I really need to get it all down on paper correctly for the benefit of the great-grandchildren. I'm also trying to find info on an officer we had whom we called 'Boy Blue'. I can't for the life of me remember when or exactly where he was killed. I'd love to hear from anyone who remembers him, or indeed anyone who remembers me. Any help or pointing me in the right direction would be much appreciated. Two Officers are listed as having died serving with 61 Medium Regt during WW2. Captain Bernard HODKINSON aged 29. Died 7/12/1942. Commemorated on the Brookwood Memorial in the UK. No known grave, so place of death not known. 61 Med Regt were in the UK at the time. 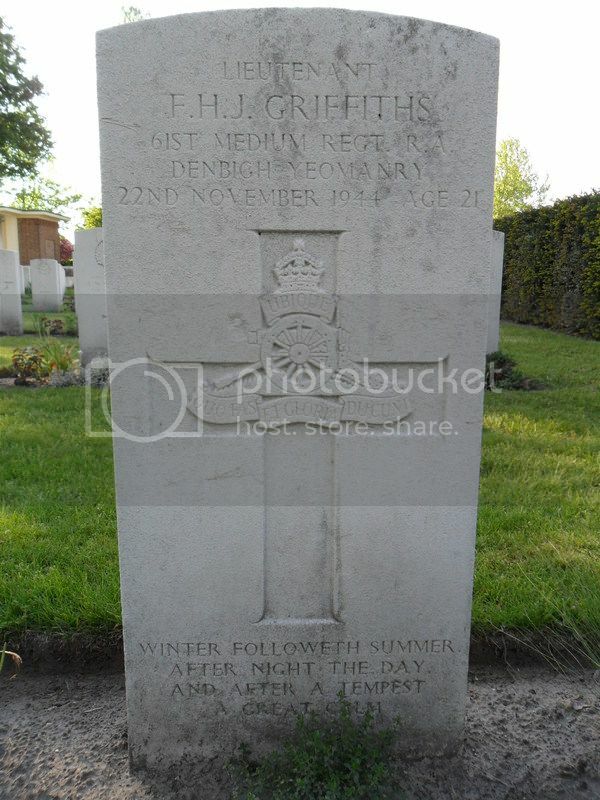 Lieutenant Frederick Hugh James GRIFFITHS, aged 21. Died 22/11/1944. Laid to rest at Nederweert War Cemetery in the Netherlands. Hope this helps to start your search for information. Welcome to the forum. The History of the 61st Medium Regiment R.A was published by Nicholas Kaye in 1950, there is one copy available on ABE books. Hopefully a member of the forum may have a copy to help with your research? I believe there are records on them in the local Archive. Certainly come across/seen something written on them - possibly in a Welsh Journal. Hello and welcome to the forum - When did you join and leave the Regiment? Can you remember what battery you was in? Thank you so much for the welcomes and the leads - especially about Lieutenant Griffiths. I never imagined I'd get such promising results so soon. I have several things to follow up now. I'll be posting an update in the next few days. OK, here's a little update and answers to some of the questions you guys asked. I joined on the 14 May 1942 and was discharged on 24th December 1946. I landed in Normandy after D-Day - I think we were in and around Bayeux forquite a while before moving North. I was almost exclusively involved in sourcing fresh water on a daily basis as I had a water-bowser truck. Some pretty hairy incidents, in Belguim especially, with crumbling river-banks etc. and getting stuck in mud. Several times I wandered away from ground we held and came across both US and German forces also on the hunt for fresh supplies. Crazy isn't it - we were all drinking and cooking with water from the same rivers. The young Lieutenant (Boy Blue as we called him - on account of his boyish features and stature) is still in my memory - although his real name was long forgotten. His death shook us up - he stood on a mine in the grass at the side of the road, which made us all very wary for a very long time. I still have dreams of that incident - poor bugger - 'Boy' Blue - he was 21 - I was 22. I was shifted between 243 and 244 battery several times, as water-bowser trucks were often 'lost' and were not replaced so fast as other equipment. When we moved to a new location I usually had a 5½ gun to tow - a couple of time I had 2 of them - what a job to negotiate the narrow lanes and farm tracks. What I would love to have is better details of where we were located on a day to day or week to week basis, as I hope to revisit the route the Regiment followed with some of my young relatives who have offered to take me over. I did go to Normandy for the 40th Anniversary commemorations but haven't been back since. My memory is letting me down - but you guys are not - thanks for all the help. Every bit of info - no matter how small is helping. My Grandfather Gunner "Nobby " Clark also served in the 61st and I am trying to source any info possible. The Netherlands website above was great but no luck with the book by Nicholas Kaye. If anyone can help anymore it would be much appreciated. Hello Singvogel, I am a complete novice with forums of any sort so please bear with me if I haven't got this quite right! I am researching my wife's uncle, Gnr Wallace Jones who was killed in action on 9 July 1944 in the Calvados region of France and is buried at the St Manvieu War Cemetry in Cheux. He was from the village of Minchinhampton in Gloucestershire and was serving with the 61st Med Regt RA (Denbigh Yeomanry) at the time of his death. I would very much like to find out the circumstances of his death but have been unable to source the war diary/history for his regiment and do not know which Battery he was serving with. He is commemorated on the Minchinhampton War Memorial but under the name of Samuel Jones. Found this in the miltary section at findmypast. That is all they have in that collection for him. Thank you amberdog45. From the form that you have added can I assume that in 1939 he would have been in the Gloucestershire Regiment before being transferred to the RA at some later date? Many thanks. I also have his copy of the 1950 regimental history so if you have any specifics I can look them up for you? I think 'his officer' was Lt 'Tommy' Atkins who he spoke fondly of all those years after. You've got me going now so I think I need to go and dig out his papers and see what information might be of interest here! Hi and welcome to the forum Law, look forward to your postings.